Trying to get teeth in a service level agreement shouldn't be difficult... but it is. I've been doing a project for a small company that has both manufacturing and retail locations. The company wanted to update its communications capabilities by getting a faster network as well as cloud-based voice. In the area where the company operates, the only economical options are bundled offers from the ILEC and the local cable provider. I had just given a No Jitter webinar on cloud-based services when I received the cable company's offer. In the webinar, I had shown a picture of a dog with fangs bared, and told attendees they need to get teeth in their SLAs. 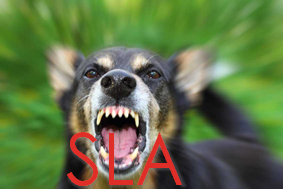 Any network/UCaaS service should include an SLA with teeth in it that penalizes the service provider, including contract termination, for poor service. The implication of my comments is that most often the terms and conditions service providers offer are extremely one sided to the point that the customer is really left with almost no recourse. In the case referenced above, I asked the salesperson about the SLA. His direct quote was, "We don't have an SLA." As a follow-up on the phone, he said that no one asks about the SLA. Following some additional cajoling, he finally referred me via a link to his company's website where there were some terms and conditions. I was specifically looking for terms that would allow my customer to terminate the contract should the service prove to be lousy -- frequent outages, long outages, etc. Effectively, I was looking for the ability to terminate the contract for cause on the part of the service provider. To my dismay, I found lots of verbiage on how the service provider could terminate the customer's contract for cause, which included late payments on three occasions, failure to pay after 10 days' notice of delinquency, customer insolvency, etc. A termination clause specified that my client could terminate the service with 60 days' notice, but the termination penalty charge would be 75% of the remaining amount on the multiyear contract. Ouch! The contract didn't contain language allowing for my client to terminate for cause on the part of the service provider. I should point out that in many retail environments, credit card processing is now done over the Internet using encrypted communications between the retailer credit card terminal, which is connected to a point-of-sale terminal, and the retailer's merchant services company. If the Internet goes down, the business is dead because it can't take credit cards as payment. Hence, Internet service is vital. Service provider makes no representation regarding the speed of Internet Service. Actual speeds may vary and are not guaranteed. (As an aside, the sales rep said the provider was selling my client 25 Mbps down and 5 Mbps up. Nowhere in this service provider's contract could I see a way for my customer to gracefully terminate the service if the service proved unreliable (multiple interruptions in any given day, week, month, etc.). A four-or-more-hour outage during a busy holiday weekend, like the Saturday before Christmas, can make the difference in a retail store between profit and loss for the entire month! I get it that networks do occasionally go down, and that's why organizations such as retailers may need redundant networks for critical applications. I'm simply using this example to make a point about service provider SLAs, delineating what's promised on the website or by the sales rep and what's contractually obligated. The sales representative had no response for my request to include a termination clause in the contract for cause on the part of the service provider. So, being the resourceful analyst/consultant that I am, I reached out to the provider's analyst relations people to see if they would put me in contact with a business product manager about getting a termination clause for cause into the contract. No one from the service provider company has responded, after a month of repeated attempts. One clear lesson for me is that end-user customers need to test how committed a UCaaS/network service provider is to the promised availability (i.e., 99.9%) and the network speeds (i.e., 25, 100, 200 Mbps) articulated by a salesperson or website versus what's actually stated in the provider's contract. If the provider won't include a clause on termination for cause on its part, end-user customers had better stay away from that service provider. And that's what I advised my client to do: Stay away -- the risks are too great. Cloud service providers should be willing to stand behind their offerings, and if they don't deliver as promised, customers need a way to gracefully terminate the service. Getting teeth into an SLA shouldn't be hard... but it is. Hear more from Brent at Enterprise Connect 2018, March 12 to 15, in Orlando, Fla., where he's presenting three sessions: Cisco vs. Microsoft: Taking the Battle Beyond UC, Real-World IoT -- How it Works, How it Integrates, and Understanding AI -- Beyond the Hype. Register now using the code NOJITTER to save an additional $200 off the Early Bird Pricing or get a free Expo Plus pass. Voice & Video SLAs: Do Yours Deliver?